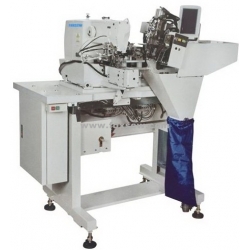 (1) Independent research and development of needle machine can be used to automatically set tab jeans and casual pants ear of a shape, easy to learn equipment operation, saving time and effort. Automatic screening, cutting, folding and tacking processes once completed, and has a simple mechanical construction, easy operation and flexible adjustment, production efficiency. (2) The unique design of automatic detection device can filter out waste pants loop joints, and implements automatic filter removal. (3) Touch-screen operating system application to facilitate the management pattern editing and data, operating functions at a glance. 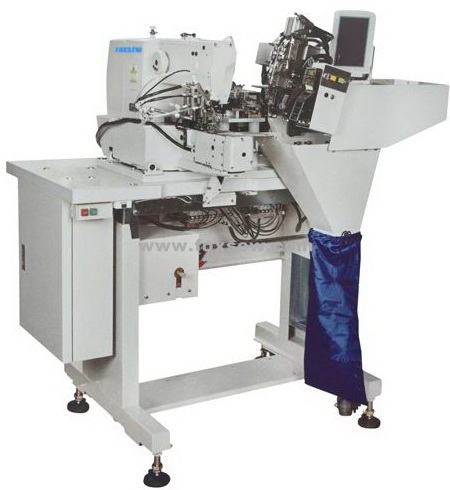 This machine streamlines procedure of four workers as cutting belt, bar-tacking, carrying and other four workers of enforcement sewing on normal sewing machine. FOXSEW FX430D-DBL saves not only the salary of workers, in average 1000$, but also improve the working efficiency by 70%.